purchased a replacement sensor but have no idea where it is located. Just replaced the cruise control switch and did not see it anywhere. Can someone guide me. Thank you. Submitted by ml320tinkerer on Jun 13, 2018. It is in the steering column. This is the best picture I could find. If you don't mind take a picture when you replace yours and post it here to help the community. Thank you for helping me with the picture. The sensor is located at the steering universal joint just under the drivers dash and accessible when the trim is removed underneath. It was rather straight forward and took about 1 1/2 hrs. This process was hopefully going to eliminate the BAS/ESP light in the left side of the dash. The dealer had already replaced the brake light switch on recall. The MB technician stated that once the steering angle sensor was replaced the light should go out. I'm now wondering if the replacement is also bad or that there is a reset procedure necessary to complete the process. Ideas?? 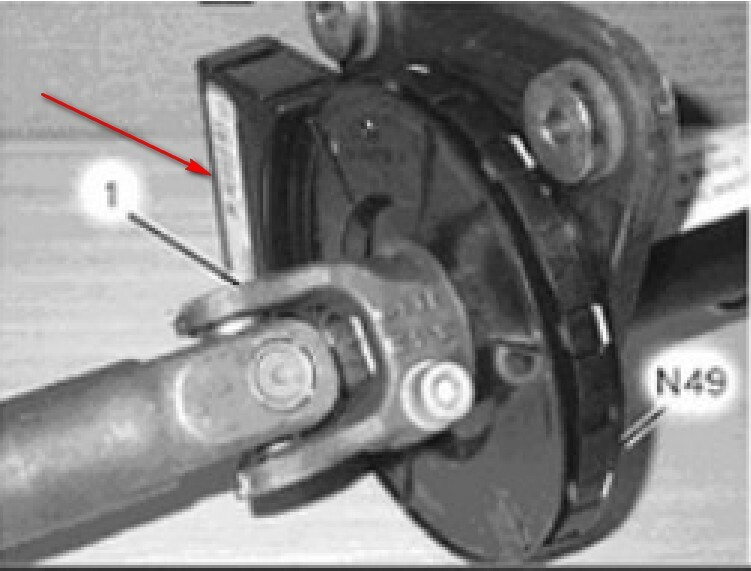 You should carry out steering angle sensor calibration. Some multisystem scanners are able to do that. I think icarsoft mb II can. Also autel ds708. I contacted a european auto repair facility who stated they had the capabilities to recalibrate for the steering angle sensor. The light came on again after driving less than ten miles. I requested the facility to reset the light and see if anything was obviously wrong. They only found that a "lateral sensor" was displayed but they did not think it had any influence on the original problem. The light came on again after about fifteen miles of driving. The light went off at the next usage. Now it came back on again and has remained on. The owner of the facility stated that if the light came back on he would not be able to help me any further. Do you have any ideas as to where to go with this challenge?? resetting dash warning lights on a 2001 Merc Benz ML 430.